With a set of features developed from decades of industry-leading experience and based directly on customer feedback, the Fujitsu fi-6800 Production Scanner can help digitize large volumes of documents with ease. With blazing fast 130 pages per minute and true double-sided scanning speeds of 260 images per minute, in color, grayscale or black & white and up to 300 dots per inch (dpi), rest-assured the fi-6800's pure scanning speed certainly will not be the bottleneck in your scanning operation. Good things come in small packages and the fi-6800 delivers production level scanning speeds, yet without the sacrifice of a large exterior design. Measuring only 12.2" high x 18.1" wide x 17.8" deep and weighing 71 pounds with quiet operation, it's practical to place the fi-6800 in front-office environments and desktops where traditionally a Production Scanners' bulkiness and loud operation was unrealistic. 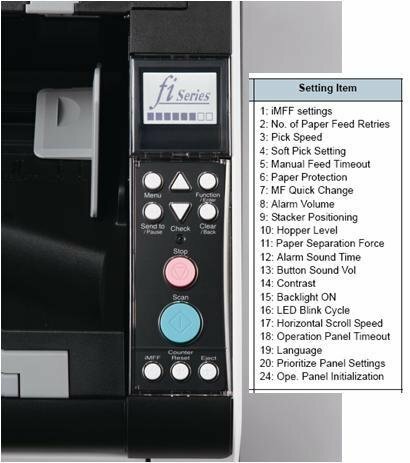 Additionally, with built-in Kofax hardware-assisted VirtualReScan (VRS) Professional technology, with both a USB 2.0 and 68-pin SCSI interface, users can benefit from decreased document preparation by utilizing some of the commonly used advanced VRS Professional features such as Automatic Page Orientation and Blank Page Deletion. Simply allow the scanners intelligence to perform automatic functions that were traditionally done with manual labor to save time and money! The fi-6800 includes a full suite of software tools in the box that make scanning simple and easy. One convient Setup DVD includes all the neccesary software needed to get you up and running quickly such as TWAIN, ISIS drivers, VRS Professional, ScandAll PRO. Additionally, a second installation DVD includes a full licensed version of Adobe Acrobat Standard. As an example of demostratings post-scanning effieciency the ScandAll PRO 1.8 Automatic Image Quality Checker (aIQC) feature allows for a post-scan check of questionable images captured during the batch scanning process. These could be possible multifeeds, accidental folded or 'dog-ear', rip/torn or other questionable images. aIQC checks them before you commit these batched images to the destination of your choice. On-site warranty helps maximize uptime. The fi-6800 scanner includes a 90-day, on-site, Limited Warranty. 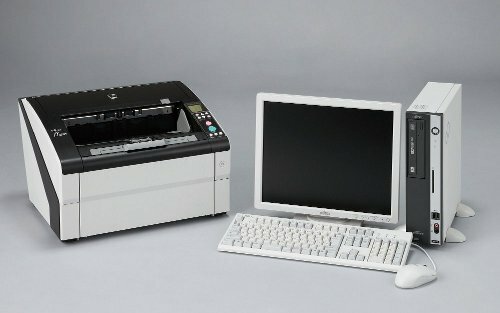 For full details on the Limited Warranty and on all service programs, go to www.ScannerOne.com or call (888) 395-8570. Dimensions (HxWxD) 18.1 in. x 16.9 in. x 12.2 in. Requires Intel ® Pentium® IV 2.8 GHz PC computer with 1.5 GB memory or above for optimum throughput. Scanning speeds will vary depending on features selection and environmental considerations.